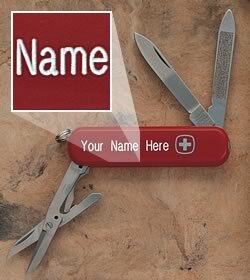 Rotary engraving is used only on Swiss Army knife handles. The process uses a .005" to .020" wide cutter rotating at 10,000 RPM and cuts with a slight slant or taper. Free color-fill minimizes this slant while highlighting and enhancing the appearance. The color fill treatment is used to minimize the beveled edge that is created by rotary engraving. In addition, color fill emphasizes the contrast of the knife handle color and the engraved logo or lettering.